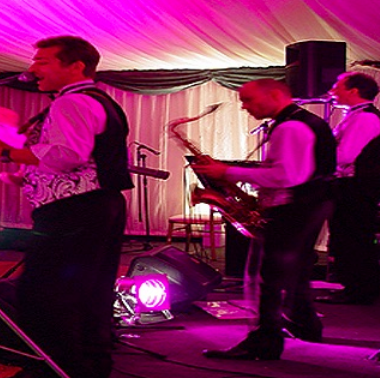 The Chris Barton Band, a dance act playing for weddings, parties, private and corporate events, performing covers of light jazz, rock 'n' roll and chart hits. As one of the best professional party bands on the circuit, The Chris Barton Band has an impressive list of private and corporate clients. And our band members are all top professionals with a broad range of experience………. Band leader Chris Barton was trained at the Royal College of Music. He has done live and recording work, including an album with Shirley Bassey, TV work for the Cutting Edge series, Touring with pop band ‘Magik’ and production work with various pop artists including Paul Gascoigne. Chris comes from a very musical family. His uncle, singer/guitarist Ken Barton, played with trad jazz star Monty Sunshine for over 15 years, and Chris’ grandfather ran his own successful band in the roaring 1920’s. Our Guitarist has been heard and seen on a wide variety of recordings, tours and TV shows, including extensive touring with Elaine Paige, Paul Weller/The Style Council (World Tour), Womack and Womack, Jimmy Ruffin & Matt Bianco, recording with Robert Palmer, Olivia Newton John, Agnetha (Abba), Chaka Khan, Sister Sledge, Anita Baker, ABC, Five Star, The Christians, Mary J. Blige, Errol Brown and The Lighthouse Family, and Top Of The Pops with Randy Crawford. Our Saxophonist has recorded with bands including Super Furry Animals & St Etienne. Our Drummer played with pop dance act ‘Innocence’ including performing on BBC1’s ‘Top Of The Pops’, with five top 20 singles. You may have heard The Chris Barton Band on the radio or seen them at any one of the hundreds of hotels and venues around the country, including Madame Tussauds, The Savoy, The Waldorf, The Café Royal, The Ritz, The London Transport Museum, Leeds Castle, Claridges, Brands Hatch, Monkey Island, Kew Steam Museum, The Hurlingham Club, The Middle Temple, Stoke Rochford Hall, Oxford University, The Royal Holloway College and many others; playing for private parties, weddings, celebrations and corporate events of all kinds. Past engagements include Jarvis Cocker’s 40th birthday party and Rick Stein’s 70th birthday party. There are few professional dance bands with the expertise and know-how that The Chris Barton Band possesses. Choosing the best songs for an audience to generate the energy to get everyone dancing, and to really get people enjoying themselves, is an art form that they have successfully mastered through performing at hundreds of engagements over several years. 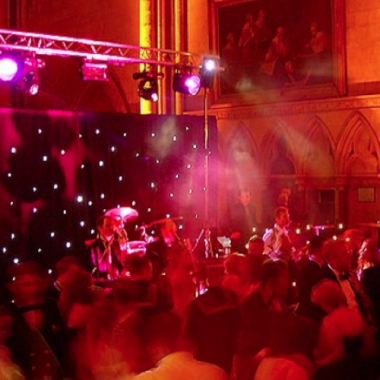 With over £20,000 worth of sound and light equipment they can comfortably accommodate all venues and gatherings from 40 to 3000 people. Their equipment is fully PAT-tested and they carry £10 million of Public Liability Insurance. Their extensive repertoire caters for all tastes and age groups, from light jazz and standards, through Rock ‘n’ Roll, right up to the most popular chart hits of the day. The band has a unique blend of excitement and professionalism. We play for all kinds of private parties, weddings, celebrations, and corporate events all over the UK and also abroad.